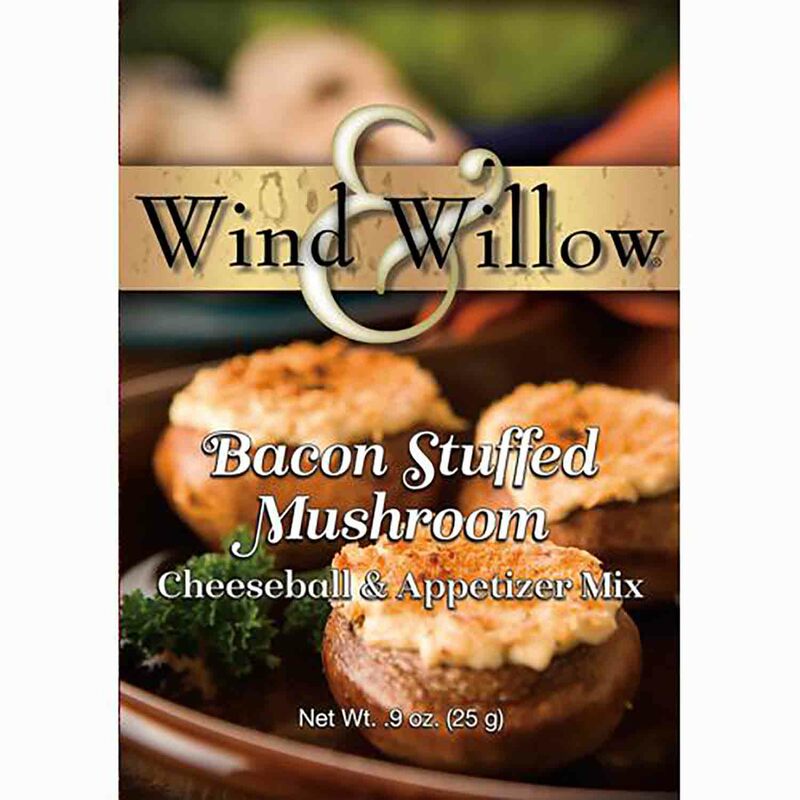 Brand: Wind & Willow WW-33112 Units: 1 mix From Wind and Willow company comes Bacon Stuffed Mushroom. Make up this beautifully packaged and delicious mix. Just add 8 oz. cream cheese and 4 tablespoons butter. Serve with a variety of crackers or vegetables or use as a filling for stuffed mushrooms! From Wind and Willow company comes Bacon Stuffed Mushroom. Make up this beautifully packaged and delicious mix. Just add 8 oz. cream cheese and 4 tablespoons butter. Serve with a variety of crackers or vegetables or use as a filling for stuffed mushrooms! Ingredients: Cheeseball: Maltodextrin, Enriched Flour (Bleached Wheat Flour, Malt Barley Flour, Niacin, Reduced Iron, Thiamine Mononitrate, Riboflavin, Folic Acid), Dehydrated Onion, Dehydrated Potato Flakes, Dehydrated Mushrooms, Hydrolyzed Soy Protein, Nonfat Milk, Salt, Sugar, Chicken Fat, Bacon Bits [Bacon (Cured With Water, Salt, Sodium Phosphate, Sodium Ascorbate, Sodium Nitrate), Hickory Smoke Flavor], Dehydrated Garlic, Mushroom Powder, 2% Autolyzed Yeast Extract, Modified Food Starch, Beef Fat, Beef Extract, Onion Powder, Hydrolyzed Corn Gluten, Soy Protein, Wheat Gluten, Spices, Disodium Inosinate, Disodium Guanylate, Natural Flavor, Caramel Color, Silicon Dioxide. Topping: Bread Crumbs (Bleached Wheat Flour, Sugar, Yeast, Partially Hydrogenated Soybean Oil, Salt), Salt, Partially Hydrogenated Soybean and Cottonseed Oil, Garlic Powder, Dehydrated Red Bell Pepper, Spices, Oleoresin Paprika, Silicon Dioxide. Contains Milk, Soy, Wheat.